Today, we will be talking about Huda Sha’arawi (also Hoda Shaarawi, or Hoda Charaaoui), one of Egypt’s top feminists. She was a pioneering Egyptian feminist leader, nationalist, and founder of the Egyptian Feminist Union. Sha’arawi’s work was immense in redefining the place of the woman in Egyptian society, and led to a new dawn for Egyptian women. Sha’arawi was born in a wealthy family in Minya on 23 June 1879. Her father was Muhammad Sultan, the first president of the Egyptian Representative Council, and the first Egyptian to rise through all the ranks of government at the time. Her father passed away when she was 4 years old. She was married at the tender age of 13 (very common in those days) to Ali Sha’arawi, a widower, cousin, and tutor with 4 children. The independent teen could not stand the austere life with her spouse and ran back to her mother where she stayed for the next 7 years. During those years of separation, she got further education and grew more independent. At the end of the 7 years, she returned to her husband with whom she later had 2 children. Her husband, Ali Sha’arawi was a political figure, and he associated his wife to his fight against British rule. 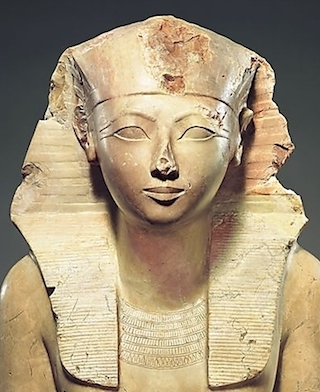 At the end of the 19th and beginning of the 20th centuries, women in Egypt were confined to houses or harems, and wore veils… This, in an Egypt which had seen Hatshepsut the female Pharaoh, Queen Cleopatra and Sultana Shajar al-Durr. As seen in all her pictures, Huda is wearing a Hijab. Sha’arawi resented such restrictions on women’s movements, and started organizing lectures for women on topics of interest to them. This brought many women out of their homes and into public places for the first time. Sha’arawi even convinced them to help her establish a women’s welfare society to raise money for the poor women of Egypt. In 1910, Sha’arawi opened a school for girls where she focused on teaching academic subjects rather than practical skills such as midwifery. After World War I, as Egyptian men started to rise loudly for their rights, many women took part in political actions against the British rule as well. In 1919, Sha’arawi helped organize the largest women’s anti-British demonstration. In defiance of British orders to disperse, the women remained still for three hours in the hot sun. Such a thing had never been heard of in the history of Egypt and even of Islam. Sha’arawi made a decision to stop wearing her veil in public after her husband’s death in 1922. 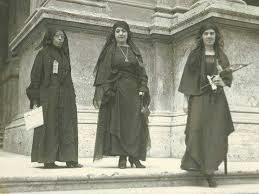 In March 1923, Sha’arawi founded and became the first president of the Egyptian Feminist Union, after returning from the International Woman Suffrage Alliance Congress in Rome she removed her face veil in public for the first time, a signal event in the history of Egyptian feminism. She fought for the suppression of precocious marriage for young girls, giving them access to all levels of education. She led Egyptian women pickets at the opening of Parliament in January 1924 and submitted a list of nationalist and feminist demands, which were ignored by the Wafdist government, whereupon she resigned from the Wafdist Women’s Central Committee. The Egyptian Feminist Union campaigned for various reforms to improve women’s lives. Among them were raising the minimum age of marriage for girls to sixteen, increasing women’s educational opportunities and improving health care. Egypt’s first secondary school for girls was founded in 1927 as a result of this pressure. In 1933, a new law is agreed in parliament (through her push) regulating the work of women in industry: making sure a woman could not be made to work more than 9 hours per day, giving her a rest day, one month of maternity leave, and 15 days of leave at half-salary after delivery of a child. This was a victory for the Union. She continued to lead the Egyptian Feminist Union until her death, publishing the feminist magazine L’Égyptienne (and el-Masreyya), and representing Egypt at women’s congresses in Graz, Paris, Amsterdam, Berlin, Marseilles, Istanbul, Brussels, Budapest, Copenhagen, Interlaken, and Geneva. She advocated peace and disarmament. Even if only some of her demands were met during her lifetime, she laid the groundwork for later gains by Egyptian women and remains the symbolic standard-bearer for their liberation movement. In 1943, King Farouk decorated Huda Sha’arawi with the Order of Kamal. Sha’arawi wrote poetry in both Arabic and French. In 1944, she founded the All-Arab Federation of Women. Huda Sha’arawi died in 1947. Sha’arawi later recounted her early life in her memoir Harem Years: The Memoirs of an Egyptian Feminist, 1879-1924. To learn more about her, check out her memoir, read Casting Off the Veil: The Life of Huda Shaarawi, Egypt’s First Feminist by Sania Sharawi Lanfranchi, this article on Forbes, and this amazing chapter dedicated to her in Les Africains, Tome 10, ed. J.A. 1978, P. 107-141. With her strong personality, unique blend of western-style feminism with her own country’s customs, culture, and Egyptian nationalism, Huda Sha’arawi influenced millions of Egyptian and Arab women and people all around the world.